If you are like me, and always looking for a something quick to whip up for weekday dinners, this simple recipe for Green Chicken Enchilada Cups will definitely make you say OLÉ! And for me, I love the zesty flavors of Mexican food and love turning many a meal into a fun fiesta, this recipe is no exception! 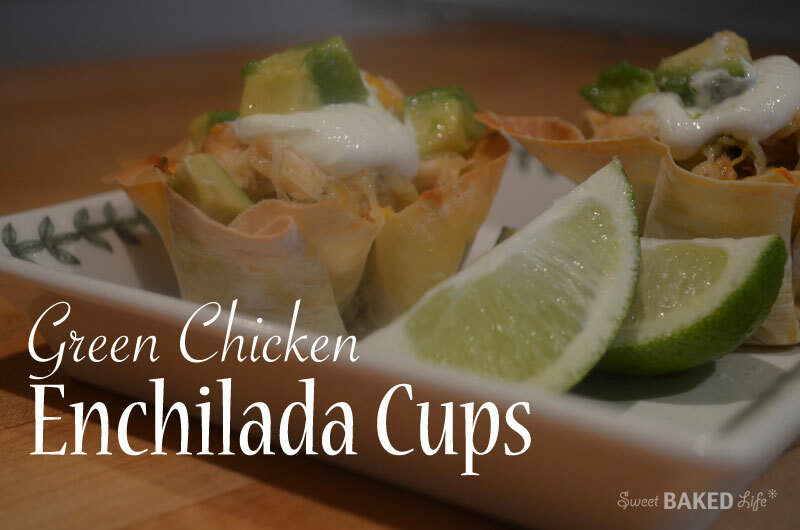 These these spicy little cups are truly winners in my book; they’re easy to make and have a delicious combination of creamy chicken against a crispy shell — magnífico! Trim the egg roll wrappers a bit to fit the cups of your muffin pan without too much overhang. Prepare your 12 cup muffin pan with cooking spray. Press the egg roll wrappers into each of the muffin pan cups, making sure that the edges to not fold in. Bake for about 10 minutes, or until lightly golden brown, then remove and place on a wire rack. In a large mixing bowl combine the chicken, enchilada sauce, cumin, sour cream and 1/2 cup of the cheese. Stir until just combined. Spoon about 1 teaspoon of the beans into each of the baked cups. Then spoon the chicken mixture evenly into the cups until they are full. Sprinkle each with some of the remaining shredded cheese. Return to oven and bake for an additional 10 minutes, or until the cheese is melted, the chicken and beans are heated through, and the cups are golden brown. Remove from oven and garnish with a dollop of sour cream, a few diced avocado pieces, and a squeeze of lime. I’m sure your family will love these little bites as mine did! Dish these up with a fresh green salad and dinner is served! These are perfect to make after a long day at the office and definitely satisfying for even the pickiest eater!